This entry was posted on October 9, 2017 by Marketing. Our goal is to provide you with quick and easy "tailored-to-you" investing as we want to help our investors avoid missing out on deals that get funded quickly. Our investors are notified by email of the automatic investments that have been made with their funds and have 24 hours to opt out. 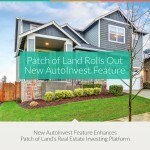 Here at Patch of Land, we see several benefits to our new AutoInvest feature and we are excited to be sharing them with our investors. A key benefit is that you will no longer have to sift through lots of different opportunities to find the ones that are most attractive to you. Nor do you need to be holding your breath, waiting at your computer, or with your tablet or smartphone in-hand for Patch of Land’s weekly email listing of investment opportunities to come across your Inbox. Manual investing can sometimes cause you to miss out on an opportunity if you don’t get to it immediately because some deals take only minutes to fully fund. And who has time to sift through all those emails anyway? Even if a deal is over-subscribed, AutoInvest participants will still get in on every deal because the technology uses a proprietary allocation algorithm to pro-rate an equitable portion of the opportunity to every investor, so everyone gets their fair share of every investment that meets their pre-selected criteria. Our co-founder and chief technology officer, Brian Fritton, is particularly excited about the “back-test” feature that the new technology offers. If you want to know “what if,” now you can. The back-test allows you to see what returns your selected investment criteria would have generated over the past year. For example, if one of our investors wants to go back 12 months and test the potential returns that would have been generated by the loans allocated via their pre-selected investment criteria, he or she can now do that. There’s no fee for AutoInvest. Our investors simply go to their investor dashboard on Patch of Land’s online platform to enroll. Once there, you’ll be prompted to select investment criteria. That includes setting a monthly funding limit that you don’t want to exceed and deciding the maximum amount of money you want to go into each individual investment. 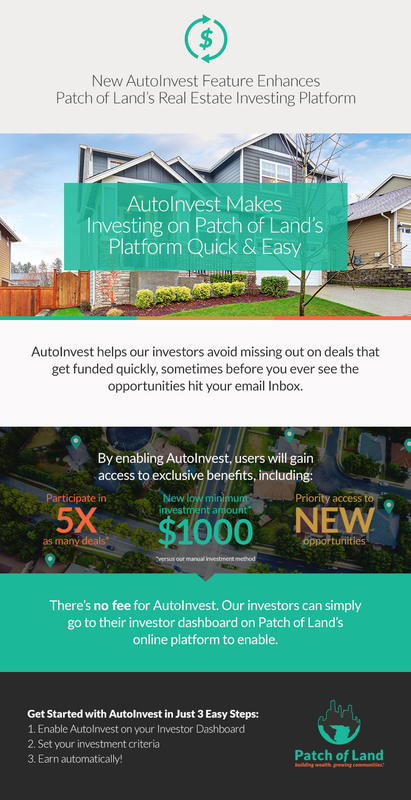 Platform investors simply use the AutoInvest dashboard to selecttheir minimum annual percentage rate (APR); their preferred loan term (12 months to 2 years); and their preferred project types, such as single-family residential, multifamily or commercial. Want to learn more? Check out our introductory video and learn how AutoInvest can work for you! This entry was posted in All Projects, News & Press and tagged automatic investing, AutoInvest on October 9, 2017 by Marketing.